The Black River Presbyterians originally worshipped with a congregation in Mendham, but soon after 1745 they organized the ?First Presbyterian Congregation of Roxbury.? About 1750, William Larrason donated a piece of land at the crest of Pleasant Hill for a church and burying ground. The very earliest building was of logs and was small and served as the church from 1751 to 1756. It was called the ?Old Hill Church? and the name ?Pleasant Hill? was not to be used for a hundred years. This is a brief outline of the history of the Community Presbyterian Church of Chester�s sanctuary building and its predecessors. The basic facts are given in chronological order. A brief, general note on early church congregations in New Jersey is at the end. A separate presentation gives the history of the members of the Chester church who have worshipped and served in the sanctuary. 1729-1736 �sometime during� � The Rocksiticus (Roxiticus) church is built in the Ralston area on present border of Chester Township and Mendham. 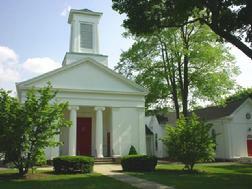 1743 � The Hilltop Presbyterian Church is formed in Mendham by a group splitting from Rocksiticus/Ralston. 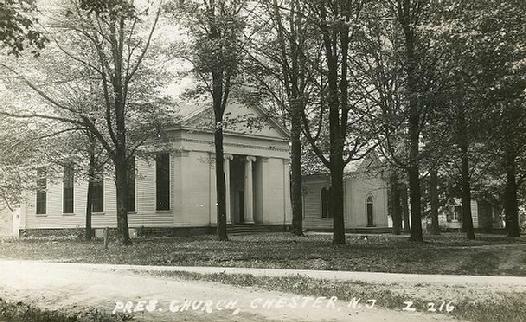 1747 � Congregational Church of Chester is formed by a group split from Hilltop Presbyterian. The church furnishings are inherited from Ralston. 1752 � Mendham Presbyterians from Black River/Chester, Budd Lake, Mt. Olive, Flanders, Schooley�s Mountain, German Valley (Long Valley) purchase 36 acres for a parsonage house on what is now Pleasant Hill Road. 1754 � William Larison donates half an acre for a meeting house. Most of the land is intended for use as a cemetery. The first �Hill Meeting House� is about 22 ft by 27ft, a �plain plank structure.� Wind blasts through cracks between boards. There is no heat. People bring heated bricks or charcoal for heat. Sermons last an hour to an hour and a half. 1785 � First Trustees of the �First Presbyterian Church in the Township of Roxbury and County of Morris� are elected. 1815 - Stoves are installed in Hill Church. 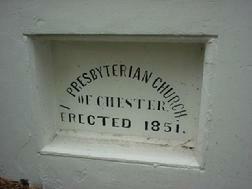 1823 � �First Presbyterian Congregation of Chester� is adopted as the new name. 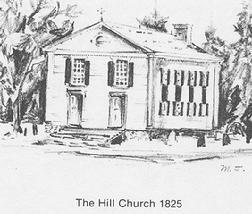 1825 � Hill Church is nearly completely rebuilt. 1838 � Mt. Olive members withdraw to form a new church. HISTORY: 1851 to 2006 to � 1851 � Two and one half acres of land on Main Street in Black River (Chester), are purchased for $247.50. The congregation disagrees on the future of the church. 1852 � Flanders members withdraw to form a new church in Flanders rather than move to town.